DeVAP stands for Desiccant Enhanced Evaporative and is a relatively new form of air conditioning that has the potential to completely change the way we heat and cool buildings. Following is an overview of how it works, what its benefits are, and why HVAC techs should learn about it. Regular air conditioning units take in hot air, condense it, dry it, cool it and then blow it into the room. While this system is certainly effective in keeping a room cool on a hot day, an air conditioning unit has to use a lot of power to dehumidify the air before cooling it, particularly in humid climates. Given this fact, it is not surprising that HVAC usage accounts for more than 12% of all electrical power used in the entire United States. What is more, many AC units use coolant chemicals that harm the environment. DeVAP air conditioning, on the other hand, does not use these deleterious coolant chemicals. Instead, it uses a liquid form of desiccant (you may know it in the form of the little “Do not eat” packets that come in shoe boxes) in combination with cutting edge evaporation technology to remove humidity from the air. This process is not only fast but also very efficient in keeping a room of any size at a reasonable temperature. As was noted above, the fact that DeVAP air conditioning units do not use coolant chemicals greatly reduces harm to the environment. As coolant chemicals have been directly tied to the thinning of the ozone layer around Antarctica, devices that use alternatives to these dangerous substances can help protect the ozone layer, thus keeping people safe from overexposure to harmful UV rays. However, this new form of air conditioning offers more than just eco-friendly benefits. It has been estimated that DeVAP air conditioning units use anywhere from 40 to 80 percent less energy than regular air conditioners. This can mean huge savings for commercial enterprises and average individuals alike. Moreover, DeVAP air conditioning has a fresh feeling to it, eliminating the stuffy, “artificial air” feeling found in most large air-conditioned buildings. Electricity companies can also benefit from DeVAP technology. 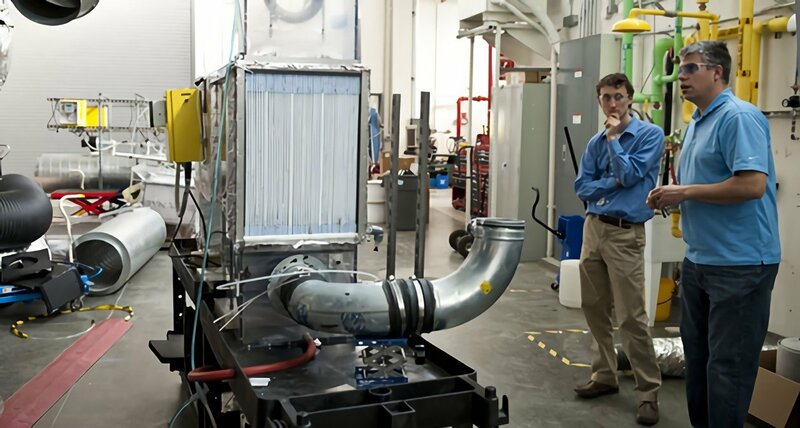 The National Renewable Energy Laboratory, which invented DeVAP technology, notes that this innovative cooling system is able to cut peak electrical demand in nearly 80% of all climates, thus reducing or even eliminating problems such as rolling blackouts and brownouts. This enables power plants to cut costs and save a significant amount of money. Why Learn about DeVAP Technology? Since this form of air conditioning has not yet become widespread, it may seem like a waste of time to learn how to work with it if you are a current or aspiring HVAC student. However, nothing could be further from the truth. Given the very positive reception that DeVAP technology has received, it may very well become popular in the next few years and be used in a variety of buildings. As DeVAP technology is vastly different than regular air conditioning technology, those who want to install, repair and/or maintain these units should take comprehensive HVAC classes and familiarize themselves with DeVAP technology. DeVAP is a visionary technology that has the potential to take the HVAC world by storm. Its simple yet revolutionary approach to cooling air enables companies and homeowners to keep their structures cool and dry for only a small percentage of what it would cost them if they used traditional air conditioning systems. Those who are interested in pursuing HVAC as a career may find it lucrative to learn about DeVAP technology, or at least keep it on the radar during HVAC training, so as to benefit from potential job opportunities in the near and distant future.